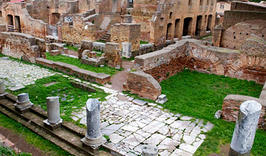 Ostia, the oldest Roman colony offers the image of a city alive and active throughout antiquity until the early Middle Ages. The archaeological area, can be visited and with paths inside and outside of the buildings, includes temples, a theater, painted houses, rich decorations on public buildings, warehouses and shops, workshops of the ancient world. You will be transported into an authentic Ancient Roman City, which remains quiet and picturesque ruins that testify the daily lives of those who lived in the past. Guided by our archaeologists you will discover the typical houses of the time, religious buildings, stores, theaters and public buildings, a journey into history that will remain impressive and unforgettable.